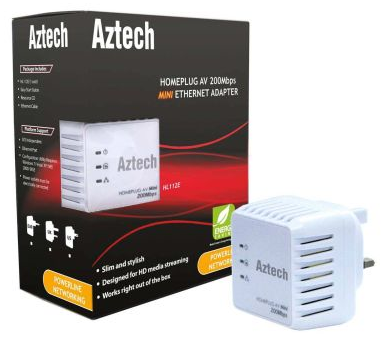 Aztech has announced its latest HL112E Mini HomePlug AV Ethernet adapter. which the company said fits snugly into a power outlet without blocking the power switch. The networking solution is designed to work out of the box with with no setup required - all it takes is a press of the "Simple Connect" button to activate it and it will secure the network with a 128-bit AES encryption. The new HomePlug adapter is rated to maintain a 200Mbps high-speed connection to support bandwidth demanding activities like IPTV, HD media streaming, video-on-demand as well as VoIP telephony. The device has an effective range of up to 200m within a single powerline grid to connect network-enabled devices to your high speed Internet line, Aztech said.